The Disher Challenge Cup was named for Captain H.C. (Clive) Disher of the Australian Army Medical Corps, who stroked the 1919 Australian Imperial Force (AIF) Number 1 crew that beat Oxford University in the final of the Inter-Allied Services event at the Henley Peace Regatta after the end of the World War I.
Disher presented the Cup to the inaugural winning crew, the Australian National University, in 1971. 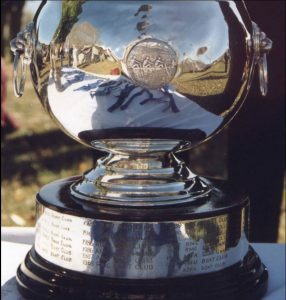 Initially the Cup was between the Royal Military College and the Australian National University until the Australian Defence Force Academy was established in 1986. Subsequently it has been open to any ACT University. Royal Henley Peace Regatta 1919.